Description Of Item: Prepare for twice the out-of-this-world battle action! 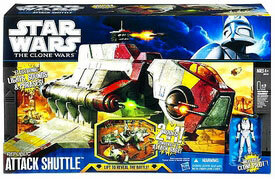 This detailed REPUBLIC ATTACK SHUTTLE vehicle features rotating wings to start it ?soaring.? Put your CLONE PILOT figure in the cockpit and then detach it to create a recon fighter vehicle! If an attack begins and you?ve got to arm yourself for battle, convert your vehicle to armored attack base mode. Electronic lights flash as the base makes announcements like ?Droid fighters ? incoming!? and ?All cannons fire? to prepare you and your CLONE PILOT figure. Get your enemies in your sights and then engage your pop-up missile-firing cannons! None of your opponents have a chance against you and this dual-mode dynamo!